Hello, all! I hope you had a truly wonderful Christmas holiday! I certainly enjoyed the extra time with family. We have a new challenge over on the Simon Says Stamp Wednesday Challenge blog this week as we bring in the New Year! 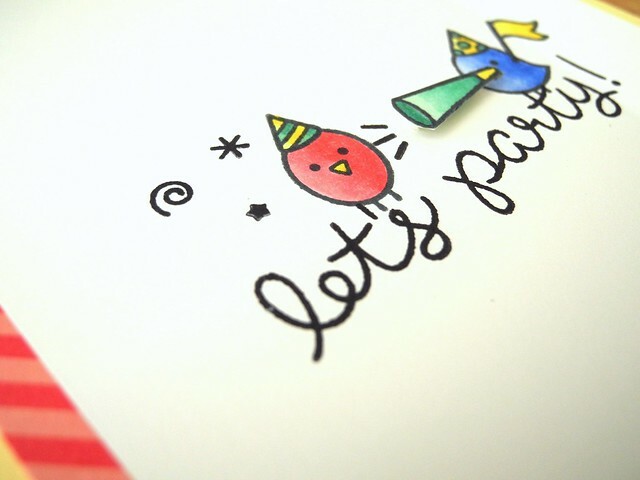 This week our challenge theme is PARTY! Yup! It's a fun one! I pulled out the super adorable Lawn Fawn Party Animal Stamp Set. Because CUTENESS!!! Oh...and it seemed to suit the theme. But, mostly, CUTENESS!!! I used my MISTI to stamp the birds and the sentiment and then stamped the little party horn on scrap paper, colored it, and cut it out to adhere with foam tape. I used Spectrum Noir pens to color my images. I played with bright, fun colors for this one! I used a thin strip of striped paper from the Lawn Fawn Let's Polka in the Dark paper pad. I also used a small accent strip to add balance to the top right of the card. I mounted the stamped panel on a yellow card base for a bit more color and fun. Now it's YOUR turn! Create something fabulous based on the PARTY theme and link it up to the Simon Says Stamp Wednesday Challenge blog for your chance to win a $50 Gift Voucher to the Simon Says Stamp Store! That seems like a fabulous way to ring in the New Year, wouldn't you say? Yep. Super CUTE!! Love it! 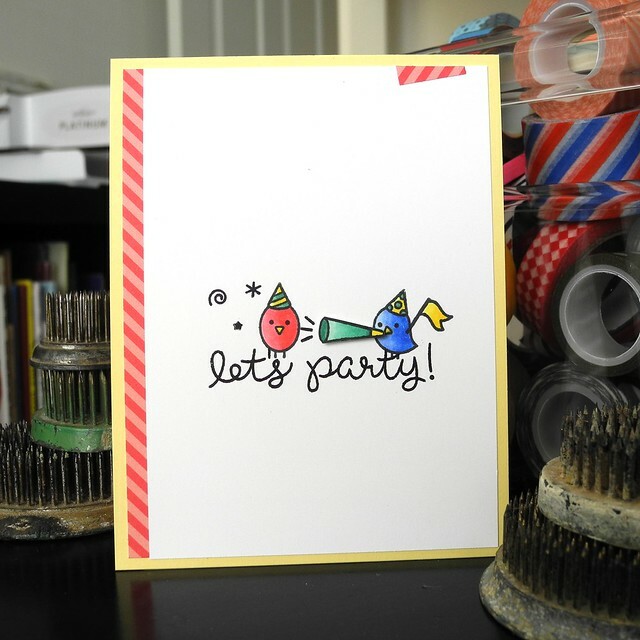 An adorable card Jennifer, I love your design and such cute little images, especially the one blowing the horn!! Too cute, Jennifer - love the bright primary colors! Wishing you a creative and happy New Year! Such a cute and creative card idea, Jennifer! One of my faves!!! yes, absolute cuteness!! Delightful card. Thanks so much for a year of DT inspiration at Simon Says. Happy New Year! Ha! I love this, too funny! An adorable card Jenn - love the clean design. Wishing you and your family a Healthy and Prosperous New Year 2016! OMGosh your card is AWWW-dorable. Thanks for sharing. Simple, cheerful and festive!!! That's how you roll! Love this card!!! Apologies for being so late popping over to you!